At last! I’ve been waiting for so long! 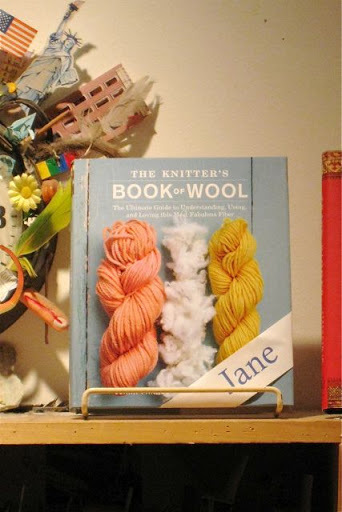 Clara’s Parkes’ Knitter’s Book of Wool has finally arrived. It’s beautiful. It’s filled with everything Clara knows and loves about wool, indispensable gifts to all of us knitters. And right there on page 168 is my very own contribution, the Falling Waters Shawl. I’m so many things right now — happy, relieved, honored, sentimental, and proud. 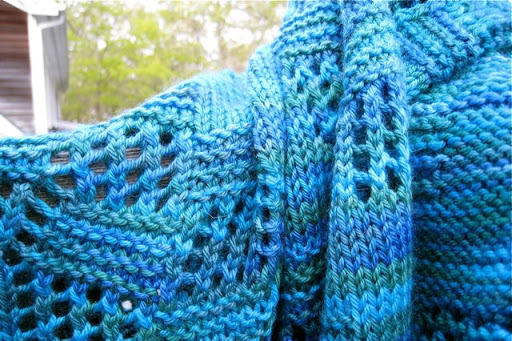 I began designing this piece at the beginning of 2008, and I finished knitting it in May, just as I was about to learn that something was really wrong with me. There were tests, feverish knitting, more tests, and more knitting. The shawl was a lifeline all through the designing and knitting. I felt so powerful, so full of a creative force, and so much myself as I worked on it, even as I got closer to knowing that I had cancer. I sent it off to Clara with joy, tempered by hope that it really was something that could find a place in her book, and not just a mess of tilting things. I loved the tilting blocks, but I also loved their balance, and the overall symmetry of the shawl. I think I needed to find some of that somewhere just then, because all I could feel was the frightening tilting of my own life. Now, more than a year later, I’m able to look over my shoulder at the long road behind me. The dreadful mountains and dark valleys, the few soft grassy places — everything, all of it, bordered by the sweet river of that blue shawl. It occurred to me that I needed a Falling Waters of my own, so I began this one a couple of weeks ago. I’m almost finished now, and I’m deep into the rhythm of the knitting. 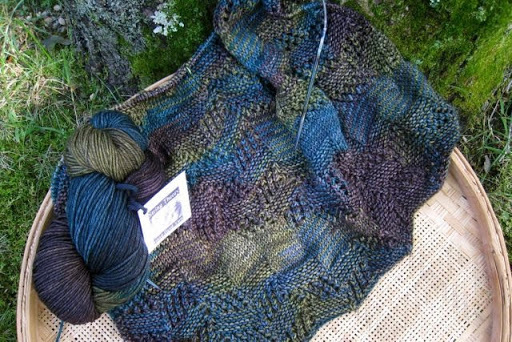 I’m soothed again, just as I was when I knit the first shawl. I’m finishing the journey. And it turns out that yes, I think I can tilt and yet remain balanced, in knitting and in life. It IS a sweet blue river! Beautiful! !And the energy that went into its design and production, wow! So SO healing.Love the name – esp. since you know how flowy and watery I think all your knitting is. Bravo!! OH MY GOODNESSWhat beautiful words and thoughts, Jane. Truly. Beautiful.and so is the shawl! You know that pattern is my favorite although I've never (yet) attempted it.Congratulations on being in Clara's book! Woohoo! How special.I'm so glad you learned how to tilt and still hold it all together.Amazing post!! I've been silently sending you love from afar for a long time without commenting. I am so happy for you on so many levels. Now is the time for me to raise my voice and thank you for your beautiful thoughts and the beautiful pattern. Thank you, Jane! Congrats! And oh, your new shawl is STUNNING. I remember seeing a post with a hint of a picture of this shawl and wanting to knit something like it, but little did I know what it was! What a surprise today when I opened my new book and saw your name and your shawl in it! I will be knitting this shawl and will think of you and your fight each time I pick it up. I hope to bump into you on Sunday, but let's make plans anyway right here at home.You must feel like a million dollars today! Very beautiful. Artistry in wool!! Congratulations on being published, now I get to go and buy the book!!! Congratulations on this beautiful pattern! I definitely noticed it while looking through the book! Congratulations Jane! Your words and design are so inspired, balanced and meaningful. Glad that you are feeling knocked over with joy. So happy for you! You know, I've never knit a shawl but in my drafty old house I've been thinking — this is the year. And now I know, this is the shawl! It's beautiful and perfect. I can't wait to get the book. That is just gorgeous – I am so excited by the patterns I've seen so far, I can't wait to get the book! What yarn are you using for yours? I am in lust about those colors! It is absolutely lovely and the story of your own struggles makes it all the more special. I can't wait to see it in the book. thank you, dear Jane, for sharing your vision of beauty in a tilting and turning world.This shawl is so stunning – I look forward to being able to make one too.May the years ahead be filled with more and more beauty. Congratulations, Jane, on the pattern in Clara's book. The yarn you chose for your own to keep is perfect for your lovely pattern. Stunning, that one.You'll just have to imagine me smiling at you from here. It's so beautiful.